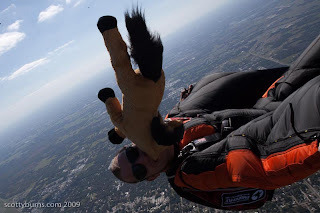 World Wide Wingsuit News: All aboard the pony express! As you may know, our very own Jarno has been over in the big old US of A at Flock n' Dock representing us Euro-peans in the world of wingsuiting. Dropzone.com user Scotty Burns has posted up some fine free fall images of the event in a thread, which you can check out here.